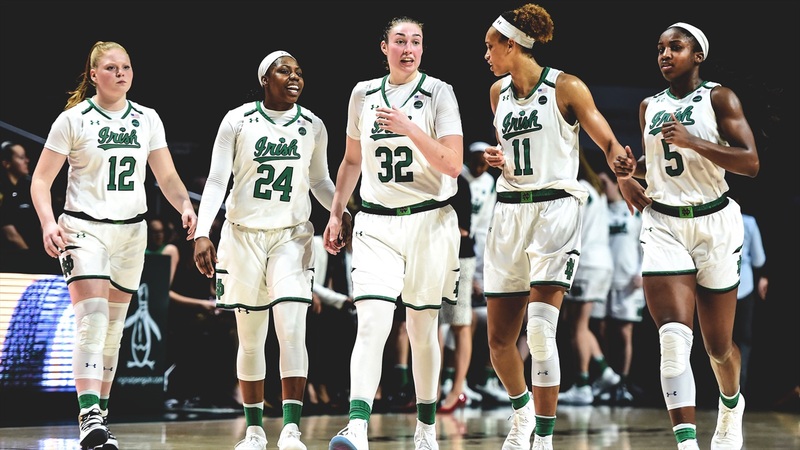 Top seed Notre Dame takes on sixteen seed Bethune-Cookman Saturday to kick off the second day of first round play in the NCAA Women’s Tournament. Game time is scheduled for 11 am eastern in Purcell Pavilion followed by the eight-nine matchup between Central Michigan and Michigan State. The winners of both games will advance to a round two contest Monday evening. Defending the national championship won’t be easy, but Arike Ogunbowale knows that having Brianna Turner back this season is a plus. For the Irish, it’s a fresh start on a six-game season after 30 regular season and three ACC tournament games. McGraw announced today that back-up guard Abby Prohaska turned her ankle in practice on Thursday and might not be ready to play this weekend. Fellow first year guard, Jordan Nixon, has practiced this week and is expected to be able to play. McGraw noted the recent play of Turner, who sat out all last season with an injury. The head coach said that Turner is playing the best basketball of her career and joins three other seniors that are making their mark as a class. Bethune-Cookman, located in Daytona Beach, Florida, finished the season 21-10, and secured the NCAA bid by winning the Mid-Eastern Athletics Conference (MEAC) tournament. The Wildcats averaged 62.9 points per game while giving up 60.2 points per game. Bethune-Cookman made less than 40% of its field goal attempts (38.3%), 30% from three and 65.5% from the line. They averaged 4.9 made threes per game and just 10.9 assists to 16.5 turnovers per game for an assist to turnover ratio of 0.7. The Wildcats feature two double-figure scorers led by 5’8” senior guard Angel Golden, who averaged 19.7 points per game. She shot 35.9% from the field and 31.3% from three. Her 90 made threes are 60% of the team’s total. She scored 20 or more points fifteen times. She’s averaged over 37 minutes of playing time per game. Chasimmie Brown, a 6’ senior forward, averages 10.5 points and 6.2 rebounds per game. Brown shot 47% from the field, but just 59.2% from the line. The other starters are Amaya Scott, a 6’1” sophomore, Camary Harris, a 5’6” freshman guard, and Amani Ball, a 5’11” sophomore forward. Scott averaged 8.6 points and 6 rebounds in 32.4 minutes, Harris contributed 5.4 points, and Ball just 2.5 points per game. The game will be televised on ESPN2 — but only to Indiana, Chicago and the Daytona Beach area. The game can be streamed via the ESPN app.